Will The Giants Target A Quarterback In April? New York became a non-factor in the NFL fairly early on this year, with neither the Jets nor the Giants (nor the Bills for that matter) managing to make serious runs at the playoffs. The difference between the teams, however, is that two have recently secured new quarterbacks and one has not. For the Bills, rookie Josh Allen was something of an unexpected revelation; for the Jets, rookie Sam Darnold took his knocks but looked like a potential star in the making – and, as some believe, is lined up to succeed under new head coach Adam Gase. Both the Bills and Jets have legitimate reasons to be excited for the future. The Giants, on the other hand, seem to be a little bit more directionless, and it stems from the quarterback position. Ask any Giants fan in your life and you’re likely to get the same answer: it’s time to move on from Eli Manning. The two-time Super Bowl winner is a lifetime hero for the organization, but is well past his prime, and now a below average quarterback, if not one of the worst in the league. Worse still is that this decline coincides with the prime of Odell Beckham Jr. and the rise of talented tight-end Evan Engram, who along with solid number two wideout Sterling Shepard ought to comprise one of the deadliest receiving corps in the NFL. The feeling, increasingly, is that in hanging onto Manning, the Giants are squandering this would-be advantage. The only real counterargument is that drafting a new quarterback now may not maximize this receiving corps anyway. While we’ve witnessed rookie and second year quarterbacks achieving great success of late, this isn’t the typical way of things. This is noted even in NFL betting guides, with one specifically noting that a team starting a rookie quarterback is typically harder to predict, and that many would sell low on said team’s chances. The average rookie quarterback, we can say, wouldn’t necessarily be better at running the Giants’ offense than Manning is right now. It would take time, as is the natural way of things. 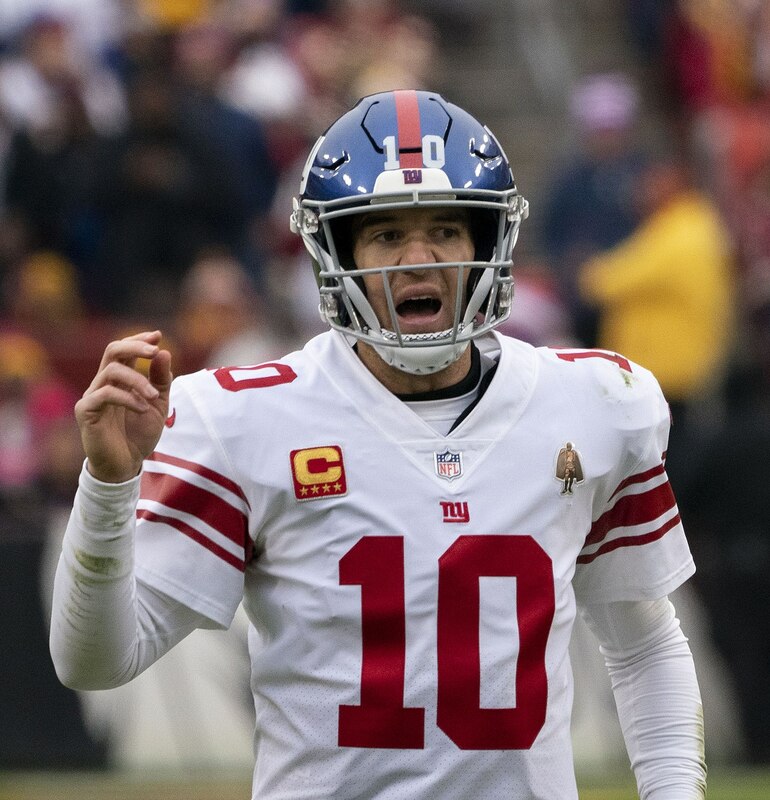 The most natural solution, which would help the Giants move on from Manning without relying on a rookie, would be to trade for Nick Foles – an idea that’s catching on with the Giants already. Whether or not this happens though, it’s starting to seem likely that the Giants could draft a quarterback in the April draft. If they also trade for Foles, this new QB would have a chance to develop behind a capable veteran; if not, the new QB would compete with Manning for the starting job. Whatever the case, here are some of the relevant names to keep in mind. Dwayne Haskins is not a perfect QB prospect at the top of the incoming class, but he’s one with significant upside. He has good size for the position as a pro, and just threw for 50 touchdowns and nearly 5,000 yards in 2018. Some believed Haskins should return to Ohio State to refine some of his inconsistency issues. However when Oregon’s Justin Herbert surprisingly announced a return to school, Haskins emerged as the clear top quarterback and chose to leave school early. He’ll likely be the top QB off the board, and could be on New York’s radar. Daniel Jones is an interesting prospect in that his talent is greater than his stats. He missed a few games with an injury in 2018 and had a sub-par receiving corps as well. Nevertheless, Jones flashes legitimate NFL ability. He’s a good, strong pocket passer and a surprisingly good runner at 6’5’’. He’s most interesting for this conversation though because his head coach at Duke was David Cutcliffe – the same man who mentored both Manning brothers. Lock is the pure talent option among the quarterbacks listed here, and the last QB in the draft with real potential to be a first round pick. He’s quick on his feet and has a very strong arm, though he also has a curious reputation for a QB as being somewhat quiet, if not standoffish. Whether this will deter a team looking for an offensive leader remains to be seen, but he’s sure to at least be on the Giants’ radar. These are by most accounts the top three prospects at the position, meaning they’re the ones the Giants are likely to focus on. However, if New York opts to wait until a round or two deeper in the draft to take a flyer on a more boom-or-bust prospect, we may also be hearing the names Clayton Thorson (Northwestern), Jarrett Stidham (Auburn), Will Grier (West Virginia), and Ryan Finley (NC State).